The play opened Feb. 25, and runs March 17-20 and March 31 through April 3 at the Rose History Auditorium, located inside the Marco Island History Museum. Written by the late Jack L. Canon, the comedy is set in the mythical, small town of Roaring Gulch where the evil Bart Black has designs on young school mistress Hilda Heartfelt. However, his competitor for Hilda’s heart is the town’s marshal, the pure-hearted, but not overly bright Wyatt Winchester. Bart Black is assisted in bringing about Wyatt’s downfall by alcohol and the feminine wiles of his saloon-owner accomplice, Calantha. The villains replace him with town drunk Hoot Hill. But their scheme could unravel, thanks to a second man in black, Slippery Stan Slade, the reputed fastest gun in the west, and a young woman named Hortense. 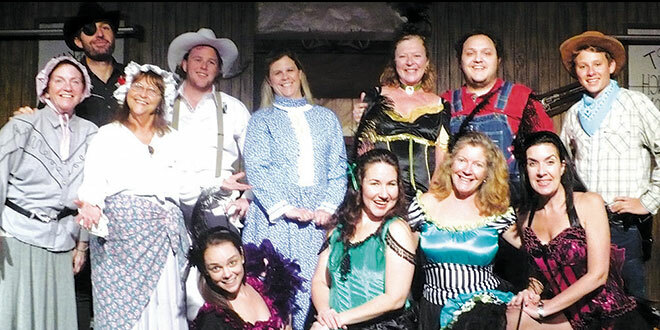 Berry directed the world-premier performance of “The Saga of Roaring Gulch” 20 years ago at the former Marco Island Players, now the Marco Players. It was Canon, who was vacationing here with his wife Mary, who made the debut possible. Canon passed away in Deadwood, SD, in 2004. He also wrote best-selling novels with his wife, including the “O’Hara Dynasty” series and more than 100 “Nick Carter” spy series novels. Canon also produced and directed plays all over the country, acted in films and television series including, “Maximum Overdrive,” based on a book written by the movie’s director, Stephen King. Berry credited Lucille Gaita, who’s reprising her role as the production’s musical director, with inspiring her to stage “The Saga of Roaring Gulch” by mentioning, last fall, that the original production’s 20th anniversary was approaching. Berry said problems arose when she couldn’t locate her copy of the play’s music. An internet search led her to the Great American Melodrama & Vaudeville Theatre, a California group where the play had just finished a run. “I called them and they gave me the information, and told me that he had passed away and that his wife was in charge of the show now,” said Berry. She was also provided with Mary Canon’s phone number, so Berry gave her a call. Berry said the production also serves as a tribute to members of the original cast who have passed away. That cast had seven actors filling the play’s 12 roles, while the current production consists of 15 actors, with Craig Wilkinson, Garrett Chamberlain and Jay Terzis alternating as Slippery Sam Slade. Joining them are a host of Island Theater Company veterans, among them John Moulton, Cathy Clausen-Neff, Judy Daye, Karen Anglin, Kathy O’Brien and Mai Puccio. The Rose History Auditorium is located at 180 S. Heathwood Drive. For more information about the Island Theater Company, visit www.theateronmarco.com or call 239-394-0080.